This week could well be the most important for Brexit in the 2 1/2 years since the referendum, with parliament set to vote on PM May’s deal this Tuesday (15th Jan) at 7PM GMT. This was previously scheduled to take place last month but was pulled at the last minute when the PM realised she would likely face a heavy defeat, and despite seeking reassurances from the EU it’s still seen by many as highly unlikely that she gains the requisite support. If the bill passes then PM May’s deal will prevail and the whole Brexit saga will finally be resolved - at least for the time being. This would likely be seen as GBP positive and could lead to a sharp move higher in the pound and see it embark on a relief rally. However, this is not the base case and the most probable outcome is still a defeat for May. Despite some remarks to the contrary a heavy defeat would also raise the prospect of a “no-deal” exit and this is the worst case scenario for the pound. Recent steps taken by MPs that essentially tie the government’s hands in preparing to soften the blow of a no-deal Brexit are seen by many as lessening the chance of this outcome, but due to time constraints this is the only realistic alternative, other than May’s deal, which could occur before the Article 50 deadline on 29th March. MPs clearly don’t favour this resolution but it remains the default outcome and unless a majority support May’s bill or extend/revoke Article 50 then it will happen. 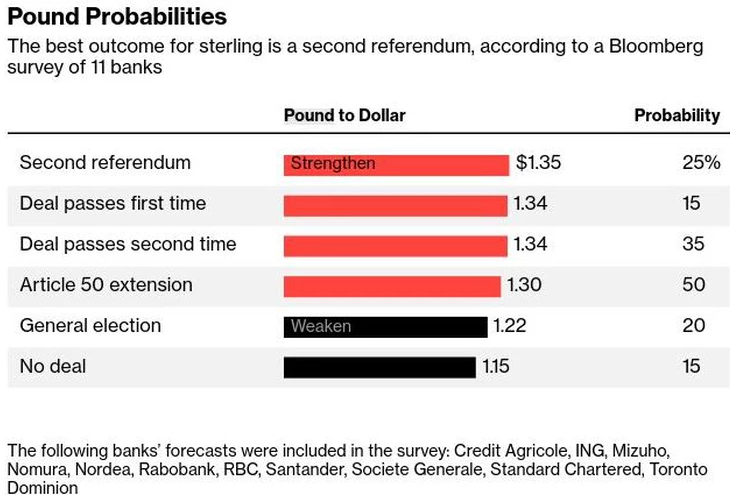 The chances of this remain improbable but are quite possibly higher than many believe and therefore this would no doubt cause the largest market move and be very negative for the pound. In the short term the FTSE (UK100 on xStation) can be expected to trade inversely to GBP if we see a large move and therefore a sharp drop in the pound could be seen to provide a bid in the stock index. If the deal is voted down as expected then due to a ruling last week, PM would have just 3 sitting days to announce an alternative “plan B”. This would mean either a vote on an amended version of May’s bill or moves towards an extension of the current Article 50 deadline beyond 29th March. 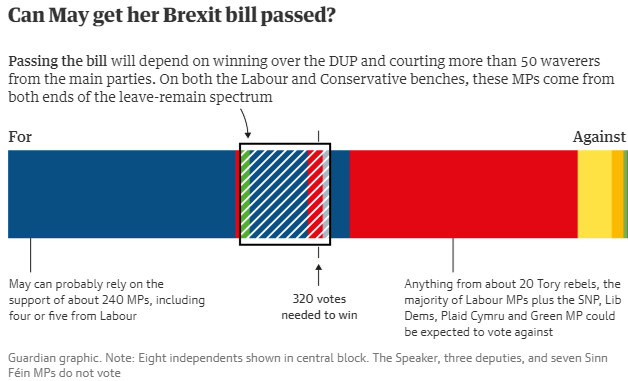 If the bill fails to pass, what is most important is the margin of the defeat - a relatively narrow loss (within 75 seats) would hearten the PM and raise hopes that a few tweaks could see it succeed the second time around. Should this occur then May will look to renegotiate terms with Brussels in the hope of gaining further concessions. It seems unlikely the EU would be willing to offer much more and with no apparent solution to the Irish backstop, one of the major stumbling blocks would in a likelihood remain. Therefore a second vote would essentially be asking MPs to reconsider their initial decision. A so-called TARP scenario, referring to the US bank bail-out package following the collapse of Lehman Brothers, is cited by some as providing a possible blueprint for how this may play out. Back in 2008 Congress rejected the package which triggered a fall of almost 10% on Wall Street, before the house backtracked four days later and approved it. Some believe that a sharp drop in the pound if May’s deal is rejected may cause MPs to reconsider their stance. With time very much of the essence PM May could probably just about squeeze in a second Commons vote but if, as is likely, this still fails to get the requisite backing then the 29th March deadline will probably look to be pushed back. There are two ways this can happen; first the UK can apply for an extension with the EU or second they revoke Article 50 altogether. The general feeling is that with EU elections set for the end of May, the bloc will be unwilling to agree to an extension unless there’s a very strong reason for it - for instance a UK General Election, second referendum or a change of tack EG so-called Norway Plus. If the EU don’t agree to an extension then thanks to a December ECJ ruling the UK can unilaterally withdraw Article 50. This would be hugely unpopular amongst Brexiters as it would look like Brexit has been cancelled and would also need some kind of democratic process to go down this route - presumably at the very least requiring MPs consent via a Parliamentary vote. A General Election remains highly unlikely as the Commons would have to vote it through and most Conservatives wouldn’t support it due to a fear that it would bring Labour into power. There remains quite a lot that needs to happen for a second referendum to get off the ground and while it is gaining some traction according to the latest polls, it would likely require at the very minimum the support of Jeremy Corbyn, the leader of the opposition, who has hitherto shown very little appetite for this. The 3rd and final general outcome under a delayed Brexit would be a change of tact with a so-called Norway-plus option the most prominent. This would see Britain stay in the EU customs union, its single market or both and would effectively render Brexit almost meaningless - the UK could end up applying Brussels’ rules, making budget contributions to the EU and only have a limited ability to restrict free movement of people. In terms of the markets, the most positive outcome for GBP would be May’s deal passing, then a narrow defeat and the worst case being a convincing loss that would kill it off for good. There’s a strong consensus that the deal will not pass, and assuming that May can’t get a second Commons vote to support it then the only realistic outcomes are a no-deal Brexit or an extension of the deadline beyond 29th March. In the longer term an extension would be seen as GBP positive as it raises the prospect of a softer Brexit - or no Brexit at all.